A comma separated values (.csv) file is a text file that contains rows of data separated by commas. From the desktop, navigate: Start > (Programs) All Programs > Microsoft® Office > Microsoft® Office Outlook. Click File > Open & Export. Select Import from another program or file then click Next. Select "Comma Separated Values (Windows)" then click Next. 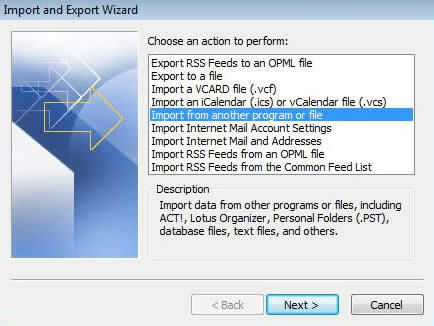 Navigate to the desired csv file then click OK.
From the "Import a File" screen, click Next. Select Contacts then click Next. Select the file to be imported then click Finish.